directly to the safety network. They do not require separate cables for the return of diagnostic signals. This results in a reduction of required hardware components. download of optimized parameter settings to the sensors in case of changes to the mode of operation and also eliminates the need to adjust parameters at the device itself in case of component replacement after failure. All this adds to a maximized productivity and reduced down time. 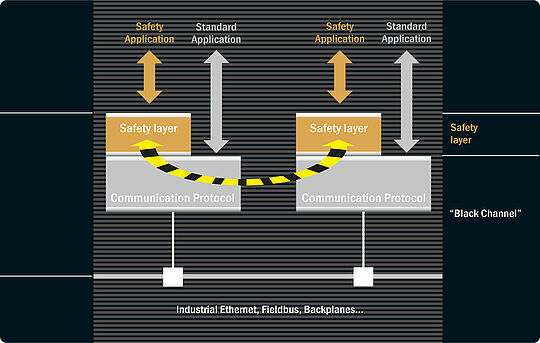 The Black Channel Principle allows transmission of failsafe and standard data via the same network or bus line. Independent of the regular data transport mechanism used on that line, safety components can transmit data using an isolated safe protocol tunneling the underlying network channel. As safe fieldbuses are pure application protocols without physical characteristics of their own, available bandwidth and cycle times depend on the data transport protocol used. Possible transmission errors are known and listed in the relevant standards IEC 61784-3 and IEC 61508. Their prevention needs to be implemented as a crucial part of the safety data transmission protocols. The required quality of transmission error detection depends on the safety level that needs to be achieved.